This nail art design was inspired by a festival wherein I, together with friends, attended earlier this week during our 5-day vacation at Tacloban City, Leyte. It was my first time to witness the Pintados-Kasadyaan Festival that happens yearly in Tacloban. This event is actually comprised of 2 festivals. The Pintados Festival and the Kasadyaan Festival. The Pintados Kasadyaan Festival highlights various ritual dance performances from all over the province of Leyte. 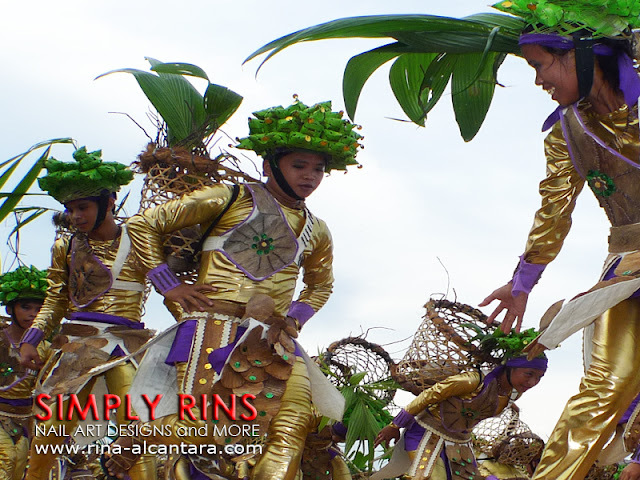 Contingents display highly creative costumes combined with body painting that emanates the theme of their dance. And so, I decided that my nails should be festive and as colorful as well. I used one coat of Sally Hansen Black Out as base color and everything else was painted using acrylic. I wanted some black outline for this hand painted nail art design. But instead of painting it after, I used a black base and carefully painted the other colors in an abstract manner, making sure I leave a thin gap between shapes. I find this technique easier to do. A contingent performs during the Pintados Kasadyaan 2011. The Pintados Kasadyaan Festival is a celebration in honor of Señor Santo Niño. It showcases the rich culture of the province of Leyte as it includes dance interpretations of folklores accompanied by indigenous music. One of the highlights of the festival is the grand parade. Participants roam the streets of Tacloban while performing their dance routines. I was really looking forward to this. Unfortunately, due to political disputes, the parade was not allowed this year and performances was held in the Leyte Provincial Sports Complex instead. Perhaps I'll be lucky next year. Anyway, I thought my colorful abstract nail art blended well during the festivities. I first wanted a swirl pattern but I figured it would be more difficult and more time consuming so I opted for an irregular pattern. I only had a few hours to do my nails and my nail art before my flight. I chose particularly bright colors for this freehand nail design. The black outlines were supposed to separate the colors and I think it was able to do its job well. Without the outlines, the colors will just blend in and it was not the effect I was looking for. I truly love that photo my friend took when we were in Tacloban. I always take pictures of my nail designs using artificial light as I always do my nails in the evening. It looks nicer under natural lighting. I always do my nails in the evening but I'll try to look for a place here at home I can do some photo shoots with such lighting. My experience in Tacloban City and a day tour at Samar will be posted separately soon. Please subscribe to my mailing list here if you don't want to miss any of my posts or nail art design. I really like this look, the lines do make it, you have an amazingly steady hand to do it the way you did. This is soo lovely! I love the irregular pattern.. And I'm fond of the way you did it, I would have done it the other way round.. I would be afraid that the colors wouldn't show up as bright on top of a black background.. Maybe that would have been the case if it was done with nail polish? You might have a harder time doing this nail design using nail polish since they dry up faster and strokes are more difficult to control. Hi, Aya! It does look like that, noh? Beautiful mani! I'm glad to learn a bit about the festivals, too. I would love to see a tutorial for this. You did such a great job! I love your choice of colors!